Dr John Sarno didn’t end up in an insane asylum, but he was ridiculed and dismissed when in the 1970’s he discovered major flaws in how the medical system was dealing with back pain. Like Semmelweis, Sarno observed a problem, made a hypothesis about a possible solution, and tested it with his patients. When he found success, his colleagues dismissed his work. Also like Semmelweis, he published a book about his findings. While the book was hailed by patients for helping them recover when countless other methods failed, it too was ignored by his colleagues. Instead of letting rage destroy him or stop his work, he continued to treat patients and refine his theories. In 2012, he retired at the age of 89 with his work still unrecognized by his peers. Thankfully, the medical community is beginning to recognize its importance and validity, but he has not yet had his Joseph Lister moment of affirmation. Eighty eight percent of the people I was seeing had histories of 1 to 4 of these other mind body disorders. And then all of a sudden I said ‘Hey, maybe this is a mind body disorder. too.’ And then I came across some of the articles that had been published by these doctors in the ‘30’s and ‘40’s. And they said rage was the major factor. I began to put it to them, and of course many patients said, ‘No that’s ridiculous,’ but some of them said, ‘Yeah, maybe…’ – and those are the patients who got better. Again, we can put this very broadly: that we all generate feelings in the unconscious mind of which we are totally unaware as a result of our life experiences which begin in childhood. How do you prove the existence of unconscious emotions? How do you demonstrate them? How do you quantitate them? You can’t. You can only use close honest observation, tried methods of treatment and see the ones that work and the ones that don’t and so on. But as far as they’re concerned, if you can’t put numbers to it then it doesn’t exist. He continued to focus on treating his patients and publishing a series of books written for patients and practitioners alike. 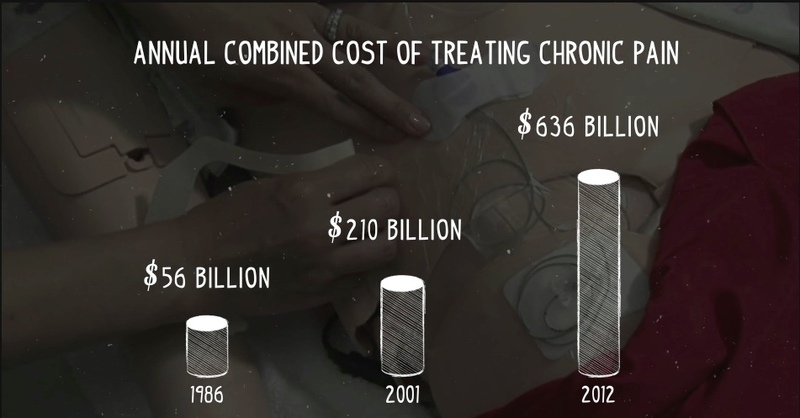 Meanwhile, pain syndromes grew at such an enormous rate that the cost of dealing with them now dwarfs almost all other medical costs – including heart disease, cancer, and diabetes combined. In 2004, Ms. Kolata began by publishing an article about the futility of treating back pain, (“With Costs Rising, Treating Back Pain Often Seems Futile”). “Yet for all the costs, for all the hours spent in doctors’ offices and operating suites, for all the massage therapy and acupuncture and spinal manipulations, study after study is leading medical experts to ask what, if anything, is doing any good. In 2006, she reported on another medical report, “Study Questions Need to Operate on Disk Injuries”. Then in 2009, her colleague Tara Parker-Pope wrote an article entitled, “Scans for Back Pain Ineffective”. Ms Kolata has been reporting about results confirming previous results time and again, yet practice doesn’t change. Instead, the use of surgery, steroid shots, and opioid prescriptions continue to grow, and Dr. Sarno continues to be ignored despite the growing body of evidence supporting his assertion about the futility of standard care. When we read Kolata’s first article in 2004, we had just started to make a film about Dr. Sarno called All the Rage. We asked if we could interview her about the article, but she said she didn’t want to become part of the story. At the time we found that not many people wanted to be associated with Dr Sarno because he was such an outlier. In fact, we had so much difficulty getting people to talk about him, or fund the film, that we had to put it on hold. When we came back to it 7 years later, things had shifted considerably. Other doctors in different fields had discovered how powerful the mind body connection is, and published their own books to get the message out. Dr. David Clarke’s book “They Can’t Find Anything Wrong” focused on gut issues and Gabor Mate’s book “When the Body Says No” zeroed in on how the repression of emotions is connected to auto immune issues. When Mate recognized the possible mind body connection, he went to see if there was any research supporting this idea and found a great deal. However, for the most part, no one was paying attention to it because it ran counter to the accepted ideas of the day. In February of 2017, the American College of Physicians issued a new set of guidelines that seem to vindicate Dr. Sarno’s primary contention that standard care wasn’t based on solid data. However, they only hint at the emotional cause of the problem. The report instructs physicians to avoid diagnostic and treatment interventions which can be costly and dangerous because the data doesn not support their use. These include doing MRI’s (because even when herniations are present, data show there is no solid causal correlation between herniation and pain), opioids, and anti-inflammatories like Tylenol. * Instead, the report suggests yoga, mindfulness, and acupuncture, tacitly recognizing that a mind body connection is at play. Unfortunately, this report is too little and too late, because Dr. Sarno’s astute prediction about an epidemic of pain has become horribly true. As stated above, chronic pain dwarfs almost all other medical expenses combined. It is now a trillion dollar per year problem. Unfortunately, it is hard to believe even with these new guidelines that standard practice will change with any real urgency or speed. The guidelines were trumpeted by major news media but quickly drowned out by a flurry of political chaos. How can this be? Elisabeth Kolbert wrote about this issue in the New Yorker on Feb 27th in an article titled, “Why Facts Don’t Change Our Minds”. In the article, she chronicles several new books that zero in on this idea. She begins the article with a discussion of subjects’ reactions to the fact that they had been told false facts during studies done at Stanford in the 1970’s. The Stanford studies became famous. Coming from a group of academics in the 1970’s, the contention that people can’t think straight was shocking. It isn’t any longer. Thousands of subsequent experiments have confirmed (and elaborated on) this finding. As everyone who’s followed the research — or even occasionally picked up a copy of Psychology Today — knows, any graduate student with a clipboard can demonstrate that reasonable-seeming people are often totally irrational. Rarely has this insight seemed more relevant than it does right now. Still, an essential puzzle remains: How did we come to be this way? To make a long story short, many researchers believe that we developed this pattern because we are social creatures. Learning to cooperate, and giving deference to power, are adaptations used to grease the cogs of social interaction. While this pattern of behavior may help in small groups settings, it seems to be problematic when faced with the threat of fascist authoritarianism, or entrenched systems in which those in power accrue benefits from their position in terms of compensation and respect – like doctors within our current medical system. As a culture, we place a great deal of faith in data to guide us as we make decisions and plans. People with degrees and higher levels of education are treated with deference and respect in large part because they both create data sets as well as know how to use, and take advantage of, data. Having been taught that the rigorous training that doctors and scientists receive gives them great insight and knowledge, we often find it very difficult to question them. Because of our respect for doctors and scientists, we also expect them to be able to answer difficult and complex questions about our health; and that they be able to offer solutions that will cure our ills. In fact, data make it clear that when we leave a doctor’s office without a prescription we have a much less favorable view of our visit. Even though doctors are often presented with situations that don’t offer a clear solution, patients are frustrated if they aren’t given one. A couple of years ago I told my cousin that the only reason that doctors prescribe antibiotics for strep throat is a small study that was done on an army base in the 1950’s. In this study, it was found that among 100 soldiers with strep throat, investigators found 2% of patients in the control group who did not get antibiotics developed Rheumatic Fever. Among those who did take penicillin, 1% got Rheumatic Fever. Based on that single study, which indicated a 1% decrease in Rheumatic Fever, it was recommended that antibiotics be given. Unfortunately, at the time there was not an understanding that there might be adverse effects from the use of antibiotics, like anti-biotic resistance, or an effect on our gut biomes. My cousin, who is a history of science professor, refused to believe me because it was clear to him that this wasn’t a solid enough foundation for the recommendation. After three hours of searching Lexis Nexis, he finally had to concede: the only thing he could find was the study I cited. The point here is that much of what we blindly accept as being built on solid science is not so solid after all. We want to believe that doctors have a factual foundation from which they base their decisions, when in reality they are largely doing what the have been taught even though much of that is not based on solid evidence. It is human nature to desire clarity. We place great value in data that can be used to tell a clear and simple story. As filmmakers, my partners and I struggle with this reality. We tend to tell complex tales in which there isn’t a clear hero or villain, and this can make it difficult for us to reach an audience that doesn’t want to struggle with complexity. There is a great deal of pressure on us to do what is expected, and because we don’t, we find that it is hard to get people in positions of power to accept our work. The same is true for scientists and doctors. They are under enormous pressure to do the kind of studies that will yield clear data, even when that clarity makes the data less useful in real world terms. This desire for clarity carries over to the media which often jumps on reports and studies that seem to have clear and catchy narratives – even when the studies themselves are less clear. Every few years the story changes: “fat is bad” is followed by “fat is good”, or “sugar is safe” is followed by “sugar is a killer”. In reality there are complex forces at play in why and how food or medicine affects our bodies and the studies are often much less clear than they are purported to be. Despite naysayers, the overriding paradigm stays in place until either a charismatic authority highlights the problem (currently this can be seen with Robert Lustig and the sugar debate) or the evidence becomes so clearcut that the major institutions call for a change in practice (in the Case of the American College of Physicians’ guidelines). Both of these situations involve the participation of the media to broadcast the need for a change. The article goes on to point out a myriad of examples whereby inconclusive evidence leads to a change in practice, like surgically implanting stents into stable heart patients with constricted arteries, or taking beta blockers to prevent heart attacks in people with high blood pressure. When evidence emerges that makes it clear that these techniques don’t reduce heart attacks or death – and in the case of the surgical implant of stents, the evidence underscores greater risk involved – the evidence doesn’t affect practice. The point is, these situations are complex. Medical facts get mixed up with impulses better studied by social psychologists. In the end, we make decisions in highly unreasonable manners. That’s fine. We just need to recognize that fact rather than pretend that data is pure, clean, and provides answers that shouldn’t be questioned. At this point it should be clear that there are problems with the way that data gets produced, interpreted, and implemented. This is not to say that the data is always manipulated with nefarious intentions, but instead that when we exist inside a system, we are often blind to the problems that the system contains- especially if our livelihood depends on that system functioning as it does. Our film All the Rage is largely about Dr Sarno and his ideas. It is also a personal story about pain and like Dr. Sarno, we have met resistance to the basic premise of the film, that our minds and bodies are intimately connected. However, those who are open to the ideas presented have found it profoundly helpful. I’ll close with a few notes we got this week from therapists and from other filmmakers who recently viewed the film. *I have edited this post after it was published. It previously included steroid shots and surgery as modalities that the ACP suggested avoiding. This is not explicitly stated- so it was removed. Long overdue study of this problem. What you’ve experienced in the medical world reminds me of Daniel Dinnett’s attempts to get philosophers to think more scientifically (The New Yorker – http://www.newyorker.com/magazine/2017/03/27/daniel-dennetts-science-of-the-soul). (I don’t really think that your article is trying to do the opposite – I interpret it as wanting science to pay attention to new types of data). Anyway I thought of you when I read this wonderful sentence: “Arguments, Dinnett found, rarely shift intuitions; it’s through stories that we revise our sense of what’s natural”.